Fleas are a type of wingless parasites belonging to the order of insects called Siphonaptera, which means ‘wingless siphon’. They feed off the blood of humans and animals such as dogs and cats. 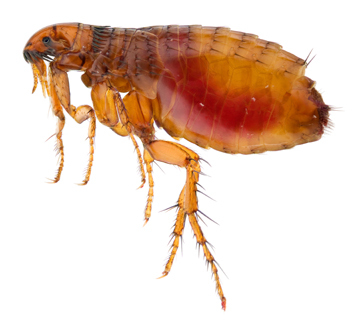 Since fleas use a wide range of hosts, diseases can be transferred from one host to another. Fleas are known to transmit tapeworm larvae and, uncommonly, the disease murine typhus. They are most notorious for transmitting “buonic’ (Black Death) plague from wild rodents to humans throughout the world in the 14th century causing deaths of over 200 million people. Now, these insects are better known for their irritation and pest status worldwide. Fleas are light brown to mahogany in colour and roughly oval shaped. Their laterally flattened appearance enables them to quickly move through the host’s hair. Measuring 2-8mm in lenght, the adults are entirely covered with a series of bristles and combs that assist them in clinging to the host.